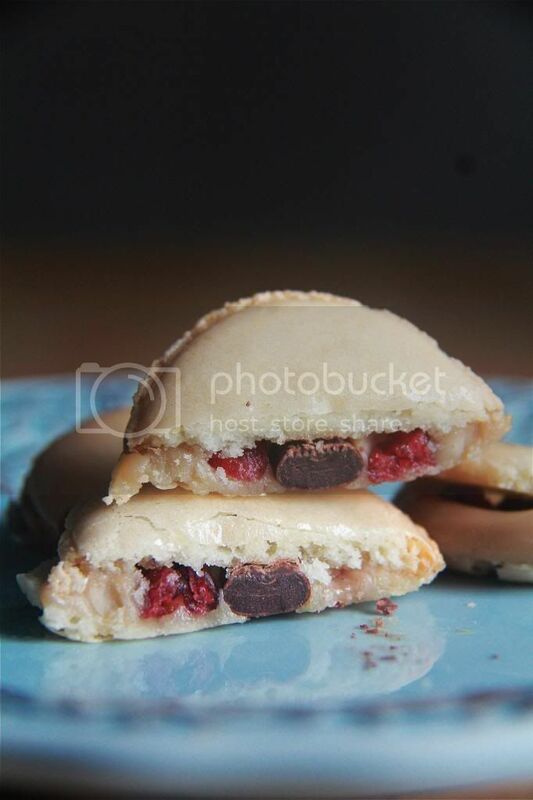 Crumbs and Cookies: white chocolate cranberry mocha macarons. A recent aimless hunt around the fridge led to the discovery of a pack of unopened ground almonds in the bottommost compartment right-hand corner, hidden beneath bags of macadamia, almonds and pistachios. It also came to mind at that point, that there was a bar of white chocolate waiting to be used, a half-finished pack of ruby red cranberries and an opened box of cream. Lightbulb moment. White chocolate cranberry mocha macarons. I'll admit here that the first batch didn't turn out successful; I didn't dry the surfaces of the piped rounds of batter out well enough so the tops cracked down the middle in an eruption of wrinkles when baked. Not to be defeated, I tried again and achieved acceptable macaron shells. I was disappointed that the shells turned out rather flat, after all I did consciously monitor the consistency of the batter, but I guess I was unfairly expecting them to look like the italian meringue macarons when these are made using the french method. Ah well, that's what I get for being lazy and turning to the less fussy way of making macarons. Whenever I halt my macaron making adventures for a prolonged period of time, I'm quick to lament that my shells look horrid and unpresentable, but this time I realised that it's actually possible to forget the skill in filling the macaron shells as well. 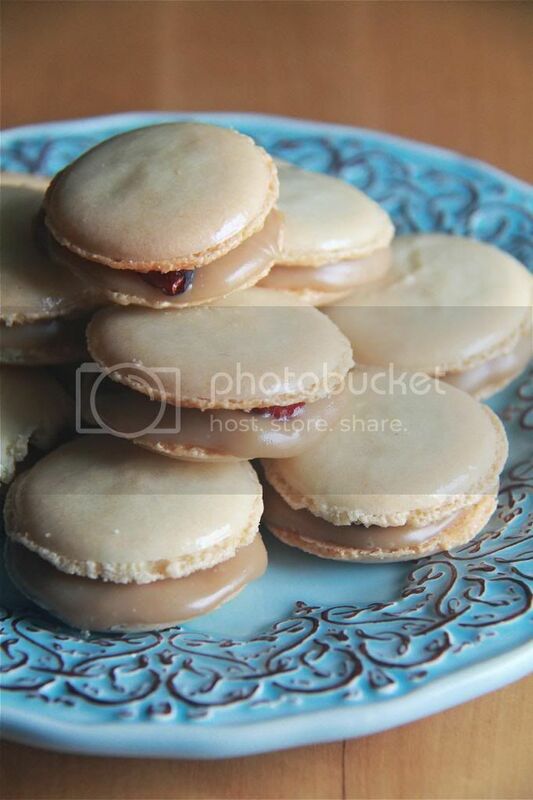 As you can see, the filling isn't well sandwiched between the macaron shells - the cranberries and mocha bean jut out very unceremoniously from the ganache, propping the top shell up and creating this unwanted space in between. After all this trouble I'm glad that these tasted good at the very least. The coffee taste in the ganache isn't so strong that it becomes a coffee-white-chocolate ganache than the white-chocolate-coffee ganache that it should be if you know what I mean. It's subtle but present. 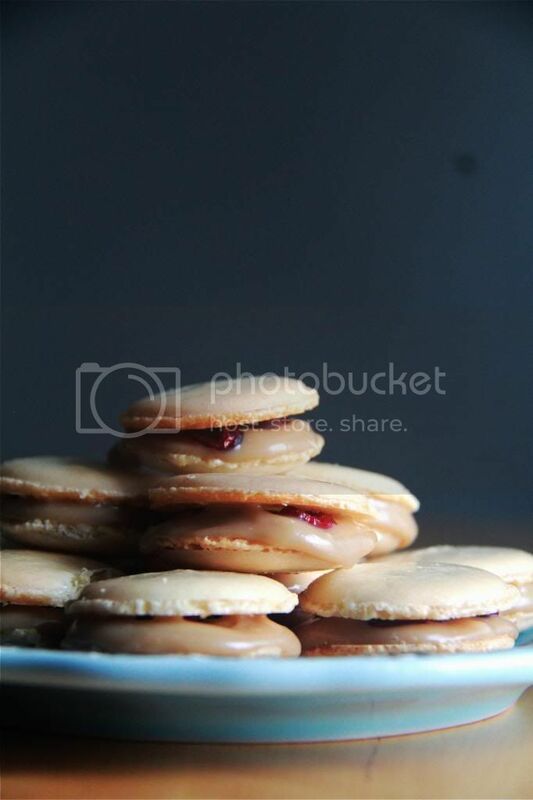 The cranberries pair harmoniously with the ganache in my opinion. Both are sweet components but each offering different kinds of sweetness; the former a refreshing fruity kind and the latter a rich milky one. And in case you're wondering, these are indeed, inspired by the Starbucks drink. Make the macaron shells: Bake the macarons according to the recipe linked, except when before transferring the macaron batter to a piping bag use a toothpick dipped in red food coloring to draw streaks of red down the insides of the piping bag. Make the coffee ganache: Bring the cream and to a simmer in a saucepan and pour over the chopped white chocolate. Let the mixture stand for 3 minutes then add the coffee extract before stirring to combine. Refrigerate until thickened to a pipe-able consistency. Refrigerate macarons for at least a day before consuming. Perfect sweetness happening here, can't wait to take a bite!